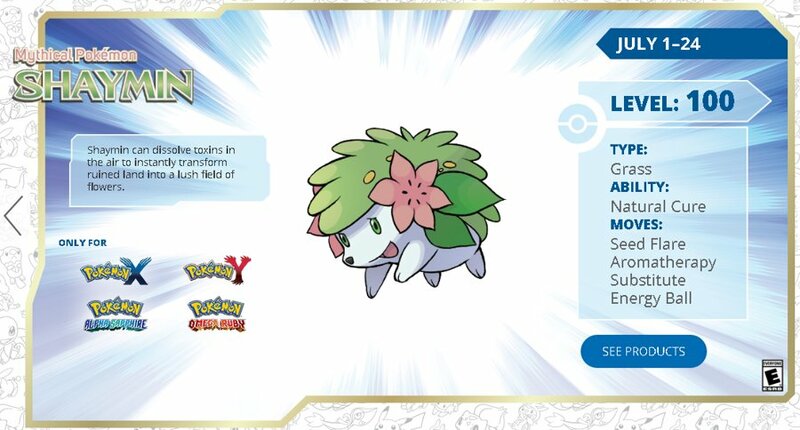 July's monthly mythical Pokemon promotion will land you the Generation 4 Legendary Shaymin. This month's event is one of eleven hard-to-obatain Legendary Pokemon that will be available each month until the end of 2016 to celebrate Pokemon's 20th Anniversary. Shaymin will be level 100 and is equipped with the ability Natural Cure and the moves Seed Flare, Armotharepy, Substitute, and Energy Ball. This Level 100 Shaymin won't be available for very long, so make sure to get it via Nintendo Network using the instructions below. To receive the Shaymin, select the "Mystery Gift" option in Pokemon X and Y, or Omega Ruby and Alpha Sapphire versions. Proceed to choose the "Get via Internet" option. Head into the game and speak to the lady that's waiting in any Pokémart to claim your Shaymin. Since this is a Nintendo Network event, you can even get a seperate Manaphy for every version of X, Y, Omega Ruby, or Alpha Sapphire you have!